Matt Poirier was preparing to coach his son, Jack , on the South Shore Regional Basketball AAU team when he first made something explicitly clear to the wide-eyed fourth grader. 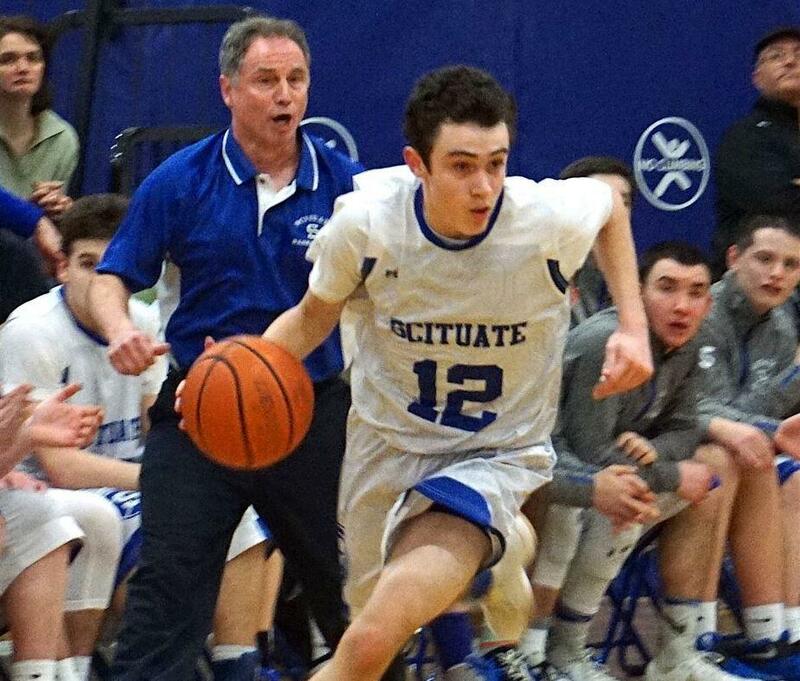 Now in his 20th year as the boys’ basketball coach at Scituate, and third season coaching his son at the varsity level, Poirier is grateful that he did his due diligence before incorporating Jack into his high school program. By setting boundaries early, Poirier has been able to establish a working relationship while helping his son become one of the most prolific offensive players in the MIAA. Jack Poirier is averaging 21.4 points per game while shooting an impressive 51.6 percent (66 of 128) from 3-point range this season. 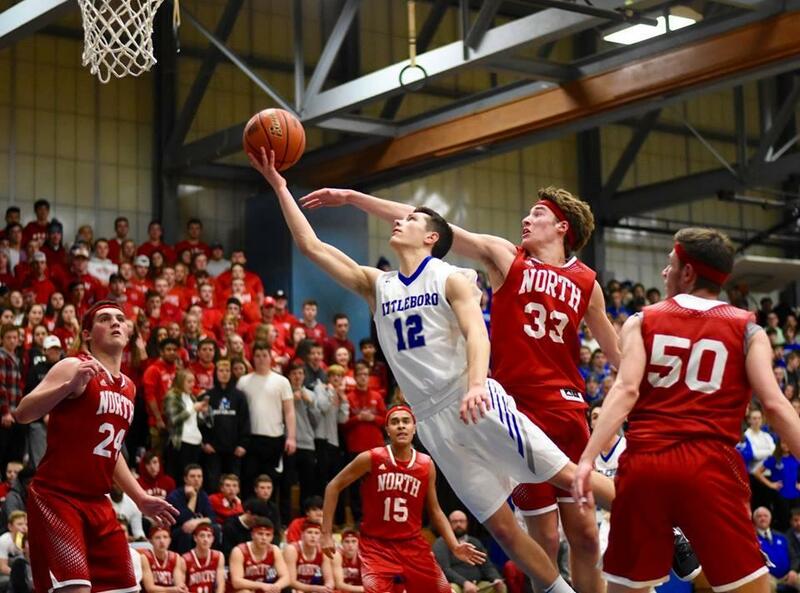 The 6-foot guard set a school record with 11 3-pointers in an 88-63 victory over defending Division 4 state champion Pope John on Jan 22, and has Scituate (14-2) in the mix for a top seed in the upcoming D2 South tournament. From his early AAU career to his first varsity starts as a freshman, Jack Poirier has made sure to carry himself a certain way as the son of the head coach. The fact that current Scituate upperclassmen Aidan Sullivan, Sam Golden, Turner Howell, and Jake Wilson all played on those early AAU teams helped the younger Poirier by giving him a group of figurative brothers to work with in his father’s system. In Attleboro, senior point guard Mason Houle is at the vanguard of a similar brotherhood. Along with fellow captains Kevin Velazquez and Bryant Ciccio, Mason played for his father, Mark, on Attleboro’s MetroWest teams in fourth grade. Mark didn’t have to go far to find advice on how to coach his son when Mason eventually earned a varsity letter last year. Mark’s father, Tom, played basketball at Attleboro from 1966-69, helped resurrect the Attleboro Youth Basketball Association (AYBA) in the early 80s, and has been JV coach at Attleboro since 1987. While Tom was the assistant coach when Mark played varsity at Attleboro in the early 90s, Mark said he learned a great deal about balancing a love of the game with a love of one’s son. During his junior year at Bridgewater State University, Mark joined his father on staff as the coach of the Attleboro freshman team. When the varsity head coaching vacancy opened in 1996, Tom stepped aside to watch Mark take the job. Freshly graduated from BSU, he led Attleboro to a state title three years later and became the school’s athletic director in 2004. This season, Attleboro (15-3, 12-2) is in contention for its first league title since joining the Hockomock in 2011. The steady point guard play of Mason, who is averaging 12 points, 4 rebounds, and 4 assists per game this season, has been vital towards the Bombardiers’ success. Attleboro’s Mason Houle (12) drives to the basket against North Attleborough last month. For both Jack Poirier and Mason Houle, playing with the same friends under the same coach (who happens to be their father) has created a valuable sense of comfort. While both families are firm in drawing boundaries, there is some discussion of strategy at home. And working with the same coach for years can allow for the use of nonverbal communication to adjust during games. “There’s a lot of times where we’ll just look at each other and we already know the plan, or what play we’re going to run,” Jack said about playing for his dad this season. The role is even more familiar for Mason, who has been playing for his father since first grade in the AYBA recreational league. “I’ve always wondered about the difference between having a father who is the head coach and not, because that’s almost always been the case for me,” said Mason. Mason’s younger brother, Evan, is on the freshman team and his youngest brother, Conner, is cutting his teeth in the AYBA’s fifth grade division. 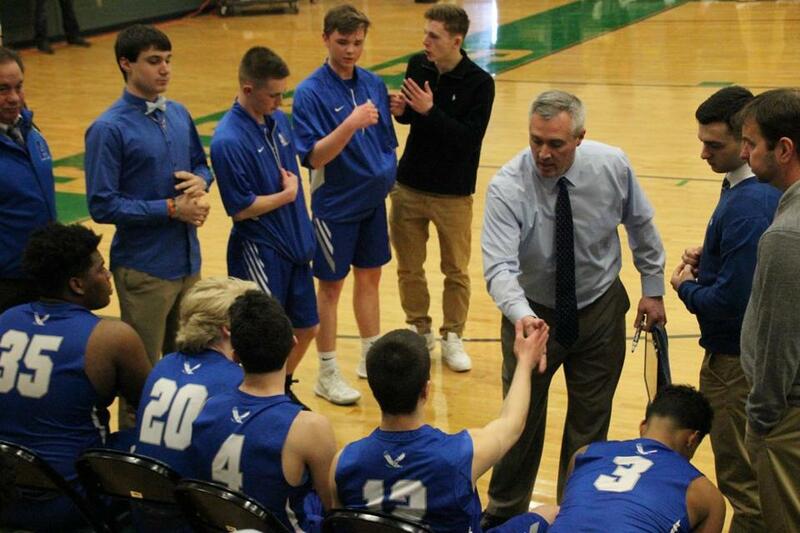 With those sons prospectively on their way toward playing varsity basketball at Attleboro, Mark Houle hopes to continue teaching them as both a coach and father. While boundaries are important, the veteran coach recognizes that there are lessons to be gleaned from competition. Attleboro coach Mark Houle shakes hands with his son, Mason, during a timeout earlier this season. ■ The seventh-ranked Belmont boys (17-1) honored a legend during halftime of Friday’s 71-53 home win over Middlesex League foe Reading. Former coach Paul Lyons, who established the Belmont Youth Basketball Association in 1976 before embarking on a 42-year coaching odyssey that included stops at Bentley, Harvard, Cambridge Rindge & Latin, and Belmont for the last 25 years of his career, was gifted a plaque to commemorate his achievements. The Belmont High court was officially named “Coach Lyons Court.” Mark Mulvey, Mike Costello, and Asa Palmer, members of Belmont’s 1993 state championship team — and all 1,000-point career scorers — were in attendance to support their former coach. Lyons was also joined by five children and 12 grandchildren, as well as his former player, assistant, and current Belmont head coach Adam Pritchard. “[Lyons] is probably one of the most respected coaches I’ve ever been around,” said Pritchard, now in his 19th year as Belmont head coach. ■ Cohasset coach Bo Ruggiero became the 21st boys’ basketball coach in state history to record 500 wins when his Skippers outlasted Mashpee, 59-58, Friday night . . . On the night of his 50th birthday, Bourne coach Scott Ashworth recorded his 200th career win, leading his Canalmen past Apponequet, 85-72, on Friday. ■ North Andover senior Jake McElroy broke the 1,000-point barrier during Friday’s Merrimack Valley Conference showdown at Lawrence, but junior guard Brandon Goris hit a 3-pointer at the buzzer to lead the Lancers in a thrilling 63-62 home win. At 11-4 in the league, Lawrence still has a shot at a share of the MVC Large crown with a win over 13-2 Lowell on Wednesday . . . Canton (10-8, 8-6) secured a second consecutive Hockomock Davenport title with a 69-43 win over Sharon Friday . . . Abington (12-6, 8-5) clinched at least a share of the SSL Tobin title for the first time since 2010. ■ President’s Day Weekend marks the start of several tournaments to prepare boys’ and girls’ basketball teams for the state tournament. The invitational Comcast Classic (featuring Newton North, TechBoston, Belmont, Hingham, Brookline, BC High, Lynn English, and Needham) highlights the action at Woburn High Feb 17 and 18. Wednesday, Hingham at Bishop Stang, (5:30 p.m.) — A favorite to compete for a D3 South title, Bishop Stang faces a great litmus test by hosting Hingham, one of the favorites to emerge from a loaded D2 South bracket. Thursday, Scituate at Hanover, (6:30 p.m.) — It’s a basketball love affair for many of the players, coaches, and fans involved in this rivalry, so it’s only fitting that these foes meet on Valentine’s Day with the Patriot League Fisher title likely on the line. Friday, Attleboro at Franklin, (6:30 p.m.) — Tied atop the Hockomock League Kelley-Rex Division with Mansfield, Attleboro hopes to win at Franklin for a chance at the program’s first league title since joining the Hockomock in 2011. Mansfield hosts Taunton at 6:30 p.m. Friday night. Friday, Central Catholic at Lowell, (7 p.m.) — These teams have managed to keep their heads above water to lead the loaded MVC Large Division and Friday’s head-to-head matchup will likely determine the league champion. Saturday, Burke at Lawrence (1 p.m.) — Last Friday, Burke nearly handed Brookline its first loss in a thrilling nonconference game. With Levar Williams and Devante Jamison healthy, the Bulldogs could bid for another upset at Lawrence. Sunday, Belmont vs. Hingham (3:30 p.m.) — In one of four exciting matchups to open the Comcast Classic at Woburn High, the fast-paced Marauders of Belmont will look to speed up a sizable and experienced Hingham squad.